A dinner of nightshade is deadly to some, but not to the three lined potato beetle. Recently, I happened across a low spreading vine, bittersweet nightshade, entwined with the grass along a forest edge. Among the beautiful blue blossoms and deep green leaves, several yellow and black striped beetles with bright orange thoraxes and equally colorful legs set about devouring tender leaves at the tips of the vines. These colorful beetles are known as three lined potato beetles. As a member of the potato family, bittersweet nightshade, or climbing nightshade, ranks high in the category of “beautiful but deadly” right along with its cousins belladonna and jimsonweed. All of these plants contain lethal chemicals in their roots, leaves, and fruit known as tropane alkaloids. If ingested, leaves or fruit of the plants can result in a host of nasty symptoms including light sensitivity, headache, delirium, hallucinations, delirium, convulsions, and sometimes death. 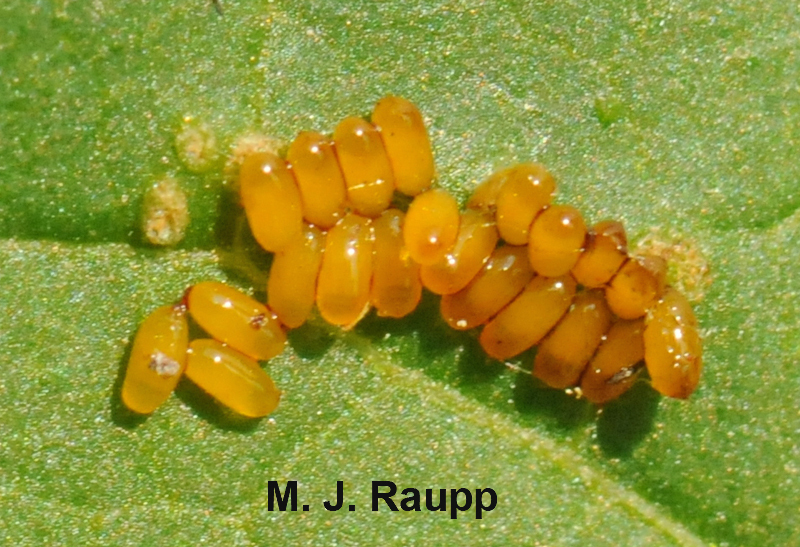 A messy cluster of eggs will soon hatch into hungry beetle larvae. One famous account of tropane alkaloid poisoning comes from Robert Beverly in The History and Present State of Virginia (1705). It seems that a group of soldiers ate leaves of jimsonweed that were included in a meal. Beverly reported their antics as follows: "a very pleasant comedy, for they turned natural fools upon it for several days: one would blow up a feather in the air; another would dart straws at it with much fury; and another, stark naked, was sitting up in a corner like a monkey, grinning and making mows at them; a fourth would fondly kiss and paw his companions, and sneer in their faces with a countenance more antic than any in a Dutch droll. In this frantic condition they were confined, lest they should, in their folly, destroy themselves - though it was observed that all their actions were full of innocence and good nature. Indeed they were not very cleanly; for they would have wallowed in their own excrements, if they had not been prevented. A thousand such simple tricks they played, and after 11 days returned themselves again, not remembering anything that had passed." Bittersweet nightshade presents beautiful blossoms. 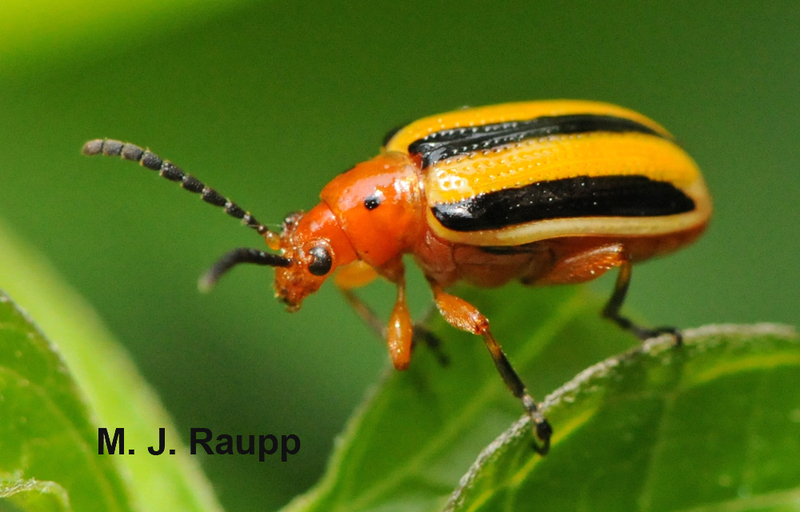 Like other members of the leaf beetle clan, the three lined potato beetle has evolved a physiological pathway to avoid or tolerate the effects of noxious chemicals. It now dines on several members of the deadly nightshade family with impunity. The striking colors of the adult beetles likely serve as a warning to would-be predators to avoid an attack lest they get a dose of distasteful chemicals. Larvae of the three lined potato beetle also have a nasty habit of piling their excrement on their back. No doubt, this too serves to dissuade predators from an attack. Next time you happen upon a patch of jimsonweed, nightshade, potatoes, other members of this interesting plant family, keep an eye out for the colorful three lined potato beetle. A pair of three lined potato beetle larvae nibbles a leaf of bittersweet nightshade. Interesting accounts by R. Beverley, "Book II: Of the Natural Product and Conveniencies in Its Unimprov'd State, Before the English Went Thither. The History and Present State of Virginia, In Four Parts,” and “The host-plant range of Lema trilineata daturaphila (Coleoptera: Chrysomelidae)” by M. Kogan and R. D. Goeden were used to prepare this episode.